and SQL Primer for free. In this tutorial we will explore using PostGIS and PL/R together. Some examples we will quickly run thru. Next create a new PostgreSQL database using the template_postgis database as template and load in the PLR support functions as described in the above article. For this particular exercise, we will assume the database is called testplrpostgis. Now load the shape files into your test database using shp2pgsql by doing the following at your OS commandline. Note for non-windows users or if you installed PostgreSQL in a non-standard directory - change the path to yours - default being "C:\Program Files\PostgreSQL\8.2\bin\". Also replace items in italics with those that match your environment. "C:\Program Files\PostgreSQL\8.2\bin\psql" -h localhost -U postgres -d testplrpostgis -c "CREATE INDEX idx_cens2000bgpoly_the_geom ON cens2000bgpoly USING GIST(the_geom)"
"C:\Program Files\PostgreSQL\8.2\bin\psql" -h localhost -U postgres -d testplrpostgis -c "CREATE INDEX idx_towns_the_geom ON towns USING GIST(the_geom)"
"C:\Program Files\PostgreSQL\8.2\bin\psql" -h localhost -U postgres -d testplrpostgis -c "CREATE INDEX idx_towns_town ON towns USING btree(town)"
"C:\Program Files\PostgreSQL\8.2\bin\psql" -h localhost -U postgres -d testplrpostgis -c "CREATE INDEX idx_schools_the_geom ON towns USING GIST(the_geom)"
"C:\Program Files\PostgreSQL\8.2\bin\psql" -h localhost -U postgres -d testplrpostgis -c "CREATE INDEX idx_cens2000blocks_the_geom ON cens2000blocks USING GIST(the_geom)"
"C:\Program Files\PostgreSQL\8.2\bin\psql" -h localhost -U postgres -d testplrpostgis -c "vacuum analyze"
In this example - we will find out the median population of a town census blockgroup, total population of all block groups within the town, and average population of a town census blockgroup, and count of block groups for each town that is within each towns boundary for all Massachusetts towns. Note: we have to do a geomunion here because the towns layer has multiple records per town. Unioning will consolidate so we have a single multipolygon for each town. The below example assumes you installed the PL/R aggregate median function as described in part one of this tutorial. The above took about 37859ms ms on my windows 2003 server and 71922 ms on my Windows XP pc, but leaving out the median call did not speed it up much so bottleneck is in the geometry joining part. If the subquery was a commonly used construct, then we would materialize it as a table and index it appropriately. Before we continue, we need to expand our R environment by installing deldir package which contains voronoi functionality. In order to do so, please follow these steps. This command should pop open a dialog requesting you to pick a mirror. Pick one closest to you and click OK. This command should pop open a dialog listing all the packages available in your selected CRAN mirror. to get a command line listing of packages available at your chosen CRAN mirror. where in this case deldir is the name of the package we wish to install. R offers some neat features as far as help goes that you can access straight from the R GUI console. Below are some useful commands to find out more about a package or drill in at examples. 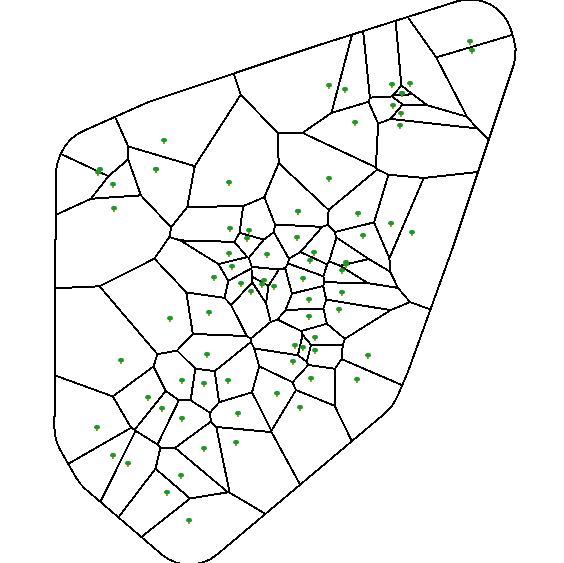 The function and voronoi type code is repeated below: Run the below in PgAdmin or psql. Note for Windows users - if you are copying this - make sure to paste in Notepad and save the file and then open in PgAdmin or psql. This will strip the carriage returns and just leave line breaks. R parser chokes on carriage returns. 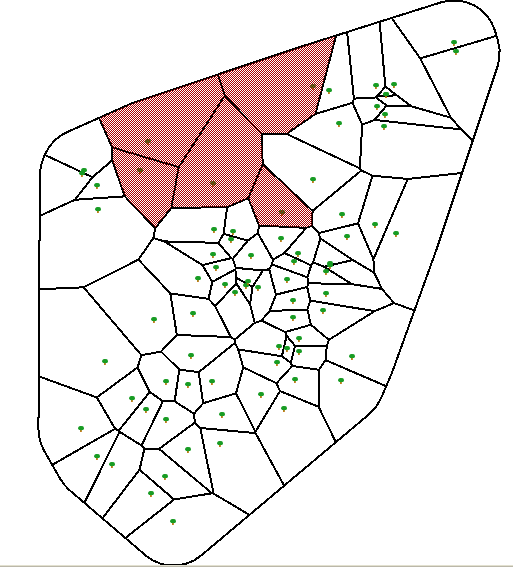 --This function uses the deldir library in R to generate voronoi polygons for an input set of points in a PostGIS table. My model is using overall population which in certain areas - like where I live - very few kids live here since its filled with yuppie executives, DINKS, and retired wealthy folk so the population here is probably very skewed. I assumed all elementary schools are created equal. For example some schools have special needs programs that others do not. Hopefully there is enough here to demonstrate how a real model would work. A Voronoi diagram divides the drawing into regions around each point that are shaped so that the borders of the regions are equidistant from the two nearest points. It's kind of the vector equivalent of grid mapping where you're trying to show boundaries of influence from point data. Not sure where that definition originated, but I like it because its short and simple to understand. Manifold http://www.manifold.net/doc/7x/transform_voronoi_operators.htm has the same definition and has some other interesting tidbits on there site.